Advair Common Uses: Advair is a combination "controller" medicine for long-term treatment to prevent or decrease the symptoms of asthma and chronic lung diseases such as emphysema, bronchitis, or COPD. Advair works to open the airways of the lungs in two ways (decreasing bronchiolar swelling and causing muscle relaxation). It may also be used to treat other breathing conditions as determined by your doctor. 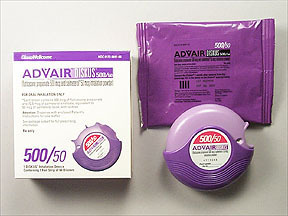 Advair does not work immediately and should not be used for acute asthma attacks. Use other "quick-relief" medicines/inhalers for sudden shortness of breath or asthma attacks. How to use Advair: Follow the directions for using this medicine provided by your doctor. This medicine comes with a patient information leaflet. Read it carefully. Refer to the illustrated directions provided for instruction on the correct use of this device. Ask your doctor, nurse, or pharmacist any questions that you may have about this medicine. Always activate and use this device in a level, horizontal position. Do not breathe into the inhaler. Do not use a spacer. Your dose is based on your condition and response to treatment. Gargle and rinse your mouth after using this medicine to help prevent dryness, relieve throat irritation, and to prevent mouth infections (e.g., thrush). Do not swallow the rinse solution. If you have been using a "quick-relief" beta agonist inhaler (such as salbutamol/albuterol) on a regular daily schedule, you must discontinue this schedule and only use it "as needed" for acute asthma attacks. Consult your doctor. Do not take the inhaler apart or wash the mouthpiece of the inhaler. STORE Advair at room temperature as directed on the package, away from heat, moisture, or light. Keep the inhaler dry at all times. CONTINUE TO USE Advair even if you feel well. Do not miss any doses. IF YOU MISS A DOSE OF Advair , use it as soon as possible. If it is almost time for your next dose, skip the missed dose and go back to your regular dosing schedule. Do NOT use 2 doses at once.